Insecticide resistance in Anopheles coluzzii mosquitoes has become widespread throughout West Africa including in Burkina Faso. The insecticide resistance allele (kdr or L1014F) is a prime indicator that is highly correlated with phenotypic resistance in West Africa. Studies from Benin, Ghana and Mali have suggested that the source of the L1014F is introgression of the 2L divergence island via interspecific hybridization with Anopheles gambiae. The goal of this study was to characterize local mosquito populations in the Nouna Department, Burkina Faso with respect to: (i) the extent of introgression between An. coluzzii and An. gambiae, (ii) the frequency of the L1014F mutation and (iii) Plasmodium infection rates. A total of 95 mosquitoes were collected from ten sites surrounding Nouna town in Kossi Province, Burkina Faso in 2012. The species composition, the extent of introgression in An. coluzzii mosquitoes and their Plasmodium infection rates were identified with a modified version of the “Divergence Island SNP” (DIS) genotyping assay. The mosquito collection contained 70.5% An. coluzzii, 89.3% of which carried a 3 Mb genomic region on the 2L chromosome with L1014F insecticide resistance mutation that was introgressed from An. gambiae. In addition, 22.4% in the introgressed An. coluzzii specimens were infected with Plasmodium falciparum, whereas none of the non-introgressed (“pure”) An. coluzzii were infected. 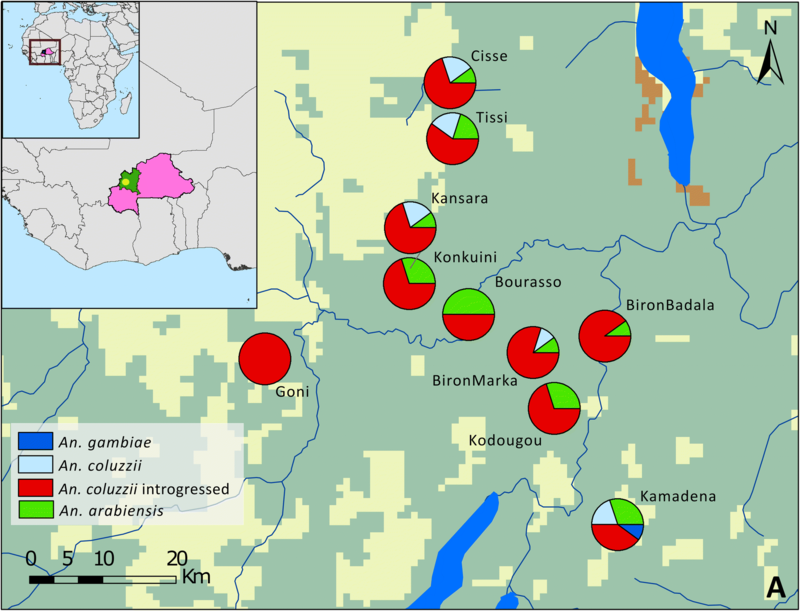 This paper is the first report providing divergence island SNP genotypes for natural population of Burkina Faso and corresponding Plasmodium infection rates. These observations warrant further study and could have a major impact on future malaria control strategies in Burkina Faso. The malaria parasite, Plasmodium falciparum, continues to be a significant cause of illness and death in Burkina Faso (BF) . In 2016, it was estimated that there were 7,890,000 malaria cases due to P. falciparum in Burkina Faso, 21,300 of which resulted in death . Two of the main vector species implicated in the spread of malaria across BF are Anopheles gambiae and Anopheles coluzzii . One of the malaria intervention strategies in the country has been the distribution of insecticide-treated bed nets (ITNs): ITN coverage increased from less than 40% in 2010 to over 60% in 2014 . However, malaria cases in BF increased sharply in the period from 2010 to 2016 . This apparent paradox may be explained by the high frequency of 2L chromosome introgression, which includes the knockdown resistance mutation variants (kdr), mutations (designated L1014F and L1014S) which have been associated with increased susceptibility to Plasmodium infection in individuals carrying this mutation . Samples collected from the Nouna Department in 2010 showed that 64% and 50% of An. gambiae and An. coluzzii, respectively, possessed the L1014F insecticide resistance mutation . Furthermore, the levels of L1014F mutation have remained relatively stable and high in the An. gambiae complex across BF, whereas the distribution and frequency of the L1014S mutation has significantly increased from < 10 to ~ 40% between 2008 and 2014 . Previous studies show that An. coluzzii collected in Benin , Mali , and Ghana  acquired the L1014F mutation by introgression of a divergence island on the 2L chromosome. Nouna Department in BF is geographically located between Benin, Ghana, and Mali; therefore, similar patterns of introgression on the 2L chromosome in An. coluzzii are expected. Previous studies determined introgression rates in BF based on 2 markers located close to the L1014F mutation . However, whole genome sequencing of introgressed An. coluzzii reveal that the genomic island of divergence, a genomic region of 3 Mb near the centromere on the 2L chromosome, which is highly diverged between An. coluzzii and An. gambiae, was introgressed from An. gambiae to An. coluzzii [6, 7]. Recently, it has also been shown that introgressed An. coluzzii mosquitoes have higher Plasmodium infection rates [3, 9, 10]. Mitri and his co-workers suggested that this phenotype is not caused by the L1014S or L1014F mutation, but most likely by the serine protease ClipC9 gene that is located on the 3 Mb genomic region that is introgressed . The ‘Divergence Islands SNP’ assay  was improved to simultaneously identify species, introgression of the chromosome 2L 3 Mb genomic region, insecticide resistance, and Plasmodium infection. The goal of this study is to determine the introgression status and corresponding Plasmodium infection rates in the Nouna Department, BF. Anopheles gambiae and An. coluzzii were collected from ten villages within a 30 km radius in the Nouna Department, BF in 2012 (Table 1). DNA was extracted from head/thorax tissue using the QIAGEN Biosprint 96 system with QIAGEN blood tissue reagents following established protocols [12, 13]. A modified version of the “Divergence Island SNP” (DIS) assay [11, 14] was used to distinguish An. gambiae, An. coluzzii and introgressed An. coluzzii. Anopheles gambiae and An. coluzzii are differentiated in the DIS assay using SNP markers on the X, and 2L and 3L chromosomes . All SNPs are located within three unlinked pericentromeric genome regions known as the islands of divergence [15, 16]. Anopheles coluzzii samples were considered “pure” when the majority (> 15/18) of DIS markers had An. coluzzii specific genotypes. An An. coluzzii sample with more than two gambiae-specific markers is considered “introgressed”. This is consistent with previous studies [11, 14]. The L1014F mutation was not considered a species-specific marker. Plasmodium infection rates were assessed by including mitochondrial DNA makers of Plasmodium species that can distinguish Plasmodium ovale, Plasmodium malariae, Plasmodium vivax, and P. falciparum (see Additional file 1). Some of these markers are from the Anopheles multi-detection assay . To accommodate all these in a single multiplex assay, some of previous DIS markers (1039-358, 0407-337 SNPs) were replace with 00819-1180 SNP. The final set of markers used for the new DIS assay and the related metadata are provided (see Additional file 1). A total of 95 Anopheles mosquitoes were collected from villages within 30 km radius in Nouna Department, BF. The species composition based on genotyping is listed in Table 1 and illustrated on the map in Fig. 1a. The raw genotyping results are listed (see Additional file 2). Anopheles coluzzii is the most abundant vector species in the majority of villages. In the village of Bourasso equal numbers of An. arabiensis and An. coluzzii were found. In Kamadena, the location furthest away from Nouna town, one An. gambiae sensu stricto (s.s.) specimen was found, together with An. arabiensis and An. coluzzii. The relative abundance of An. arabiensis (20%) observed near Nouna differs from previous reports that An. arabiensis was absent in that location . This observation suggests that An. arabiensis can increase in abundance after successful introduction of insecticide-treated bed nets, as observed in many locations throughout sub-Saharan Africa [18–20], possibly because it is less affected by insecticide-treated bed nets compared with An. gambiae . Furthermore, the relative abundance of An. gambiae observed (1.1%) is significantly lower than that reported by Namountougou and co-workers, who found An. gambiae at a frequency of 23.3% in their survey . The overall pattern is consistent with a collapse of the local An. gambiae s.s. population, apparently being replaced by introgressed An. coluzzii carrying the L1014F (kdr) mutation, as observed in Mali . The majority of specimens we collected were An. coluzzii (75 out of 95). Of those, 89.3% were individuals that showed introgression of the chromosome 2L genomic island of divergence . The 2L introgressed An. coluzzii includes the L1014F mutation originating from An. gambiae (Table 2). One heterozygous L1014F mutation in a “pure” An. coluzzii individual was observed, which based on the genotyping assay, showed no further history of introgression with An. gambiae (all An. coluzzii specific SNPs present on the 2L chromosome). Similar patterns of introgression of the 2L chromosome were observed in Mali [6, 21], Ghana  and Guinea Bissau . In addition, 3 out of 19 An. arabiensis mosquitoes (16.8%) were heterozygous for the L1014S mutation (kdr-e) (Table 2). This variant, originally found in East Africa, is now increasingly found in West Africa [22, 23]. From 95 Anopheles specimens sampled, 18 were positive for P. falciparum (19%, Table 3). This infection rate is comparable with those observed in Cameroon , Kenya  and the Democratic Republic of Congo . Infections by P. ovale, P. vivax, or P. malariae were not observed among the samples. The infection rate in introgressed An. coluzzii (N = 67) was 22.4%, whereas none of the non-introgressed, “pure” An. coluzzii (N = 8) were infected with Plasmodium (Table 3). The SNP genotyping assay can detect P. falciparum, P. vivax, P. malariae and P. ovale, but all infections detected were with P. falciparum. The difference in Plasmodium infection rates between “pure” and introgressed An. coluzzii were not statistically significance using Fisher’s Exact Test (p = 0.345) due to the low number of pure An. coluzzii mosquitoes. Power calculations based on this data indicate that further studies with increased sample size (N > 190) would likely be required to provide sufficient statistical rigor. Although differences in the Plasmodium infection rate between introgressed and non-introgressed, “pure” An. coluzzii is not statistically significant, there is evidence in the literature that introgressed An. coluzzii may be more susceptible to Plasmodium infection . Silencing the serine protease ClipC9 gene, which is located within the 2L introgressed genomic region, does significantly increase parasite numbers in An. coluzzii laboratory colony mosquitoes . One may also suspect that increased longevity due to increased insecticide tolerance could affect the rate of Plasmodium infection in introgressed An. coluzzii. Moreover, whether this pattern would hold over multiple collections across different seasons remain to be determined. Further research is required to understand the true impact of this gene in natural An. coluzzii populations. The results indicate that introgressed An. coluzzii is the primary malaria vector in the Nouna Department of BF. These populations carry the L1014F and L1014S insecticide resistance mutations and also have higher Plasmodium infection rates compared to the other Anopheles populations observed in the region. These observations warrant further study and could have a major impact on future malaria control strategies in BF. MH, NB, GL, YL conceived and designed the study; NB collected samples; MH, YY, YL collected and analysed the data; OK mapped the data; MH, HH, IE wrote the paper. All authors read and approved the final manuscript. We would like to thank Allison Chang for her help with the literature search and sample processing. We thank the University of California—Irvine, Malaria Initiative (UCIMI) for their support. This study was supported by University of California, Davis (Bridge Funding). 12936_2019_2759_MOESM1_ESM.xlsx Additional file 1. SNP information on the DIS assay. 12936_2019_2759_MOESM2_ESM.xlsx Additional file 2. Raw genotyping data of the collected mosquitoes around Nouna, BF.